Decorating for a baby shower? 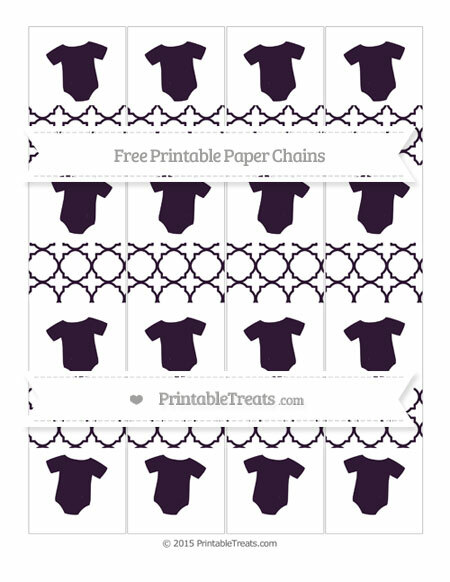 Print out these fun free dark purple quatrefoil pattern baby onesie paper chains and link them together for an easy and quick baby shower decoration. This cute baby onesie paper chain set has four paper chains on one page. They are decorated with alternating blocks of color and baby onesies. I suggest printing out baby onesie paper chain sets in multiple colors that match your baby shower theme. Then alternate the colors when linking the chains together. You can find more baby onesie paper chains in different colors by searching this site for “baby onesie paper chains”.